Hi and welcome to the Sizzix Fresh Vintage blog hop! We are on the 2nd week of the blog hop and for today's project, we were asked to use "flower layers #9" from Eileen Hull's Fresh Vintage collection. Since Halloween is coming up at the end of this month, I decided to make a card using the die. I used Sizzix album, fanciful XL die for the background of my card. 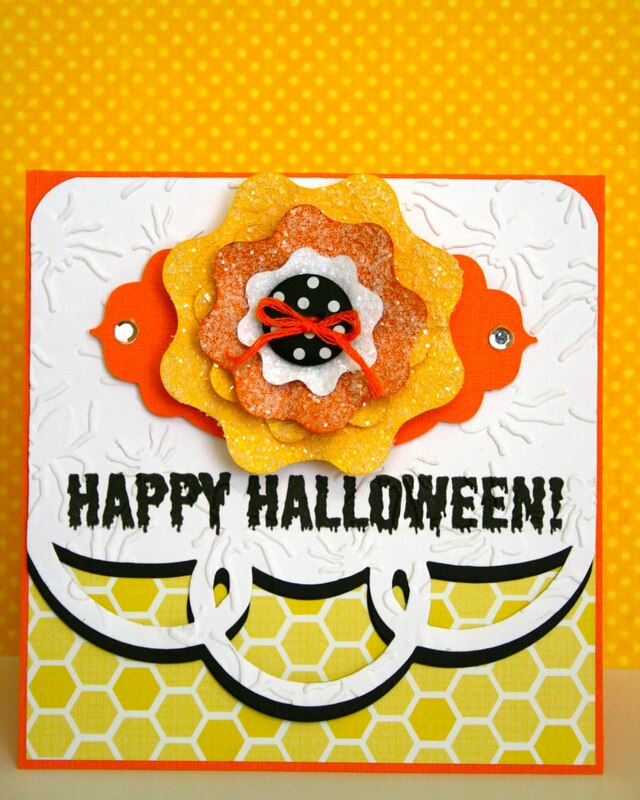 First I stamped "Happy Halloween" from The Stamps of Life clear set, and I used leftover die cut pieces in black and white from a class we did last year and embossed it with the spider textured impressions folder from the spider & spiderweb set. I cut the label design with my Eclips machine using the basic shapes cartridge. While working on my project, I kept thinking about candy corn which is why I chose the 3 colors for my flower. And because I love using glitter, I poured chunky white glitter over each flower piece. Here's a close up of the glittered flower. To visit all the other designers on this week's blog hop, simply click on the navigation bar on the Sizzix Fresh Vintage logo on my sidebar. Want to win this die? Check out Oh My Crafts for a chance to win this die. Thanks for stopping by today and I hope you're having fun and getting lots of inspiration from visiting all the other designers on this blog hop!!! Yummy! Luv the idea of candy corn for this project! Oh, that glitter just tops it off! :) Luv, Luv, Luv! The colors on this card look yummy... love the dies! What a cute card. And, you can never go wrong with candy corn colors! Cheryl! Wow! I love everything about this card, and especially the chunky glitter that makes it look edible. Stunning! On my way to the store to buy candy corn! This card is so cute- your cards are always so clean and happy Cheryl and this is a perfect example. Love this and thanks for joining the hop! Such a perfect Halloween card.... Love all those glitter effects on it and the colors make it so delish looking.... the senitment is awesome too... Such a great die! Beautifully done! Love the candy corn colors! I love your halloween card. love the colors and when you added the glitter it mad the Beautiful flower pop thanks for sharing and for the chance to win. Adorable-I'd be thrilled to get a card like this! Very pretty, love candy corn colors and the glitter. This card just makes me happy! Halloween never looked so cute! The colors and glitter with that hint of black just pulls this sweet card together Cheryl. Love that sparkle! The flowers look sugary sweet... almost good enough to eat. Sweet card idea! Halloween never looked so warm and pretty! The glitters made the flowers look sweet! Lovely!